Prince of Persia: The Sands of Time‘s stunning visual effects were created almost entirely in London, with Framestore contributing some 124 shots, including the creation of the movie’s breathtaking penultimate action sequence. Dastan (Jake Gyllenhaal) is a street urchin in Persia. After showing valor in battle, he is adopted by the king as his heir, so the king’s two sons will not fight over the throne. He teams up with Princess Tamina (Gemma Arterton) to rescue the Sands of Time, a gift from the gods that controls time, from the hands of the villainous nobleman, Nizam (Ben Kingsley). 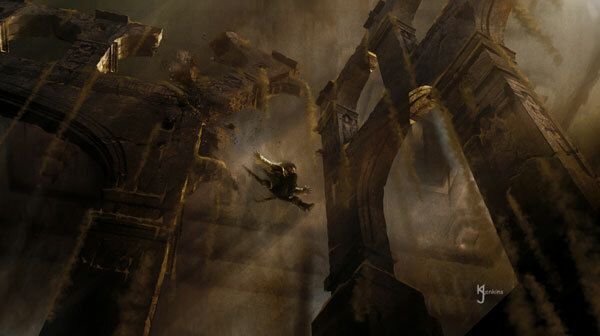 The two main elements on which Framestore worked were the Hassansin Vipers, a breed of murderous, supernatural snake that Dastan has to fight, slay and even dissect; and the Sand Room sequence, featuring a deadly chamber filled with a sandy vortex through which our hero has to pass en route to his showdown with Nizam. Both of these contrasting elements – one creature, one environmental – were concepted, created and executed in-house at Framestore, with the company’s artists and technicians playing a crucial role in developing them for the screen. The Sand Room sequence began life as a logistical problem. As the film’s climactic showdown between hero and villain draws near, the script and edit had brought Dastan to within shouting distance of his nemesis, but had not yet come up with a satisfactory transition sequence through which Dastan could struggle, which would take him from this beautiful city to the showdown’s location. 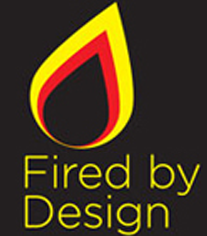 The idea the Framestore team came up with was simple, audacious and totally in harmony with the film’s themes and imagery. Dastan and Tamina find themselves at the edge of a huge chamber. The room feels oddly proportioned – it’s very wide, deep, and feels slightly flat, with huge buttress supports that don’t seem to make sense, and a huge light stream coming through the roof over a cupola. 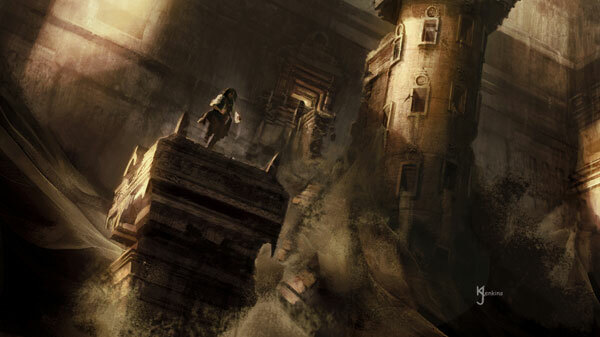 Tamina says that they must make their way to the cupola and, using her magic, illuminates a path from which Dastan must not stray for fear of activating the chamber’s defenses. All is going well until a tiny pebble is dislodged and hits the sandy surface of the ground beside Dastan. Immediately a hole forms through which the sand begins to fall, and within seconds the plughole has become a whirlpool and the entire sandy contents of the chamber are dropping away, revealing an entire cityscape beneath which also begins to crumble and collapse. The couple are separated, with Tamina making an early escape, and Dastan must use every physical feat in his repertoire to elude a sandy demise. 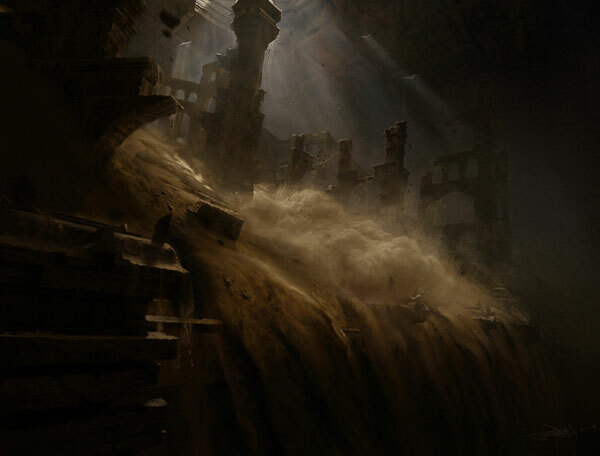 Every project throws up its own heroes within its team, and Prince of Perisa was fortunate enough to produce two such individuals: Alex Rothwell, Lead FX Artist, who developed ingenious and invaluable technical solutions to the unique computing challenges posed by both snakes and sand; and Kevin Jenkins, VFX Art Director, whose concept art work for the Sand Room so impressed the film’s production team that he found himself seconded to their art department for six weeks. Here he worked closely with Production Designer Wolf Kroeger and Supervising Art Director Gary Freeman, helping ensure that the Sand Room sequence looked as good as it could. About 75% of the sequence features an entirely digital environment, whilst the Dastan we see is a cunning blend of Gyllenhaal, stuntmen and digital doubles. For a sense of the scale on which the team was operating, one not untypical shot contains some 1.2 billion sand particles. With a sequence as tightly choreographed as this, the sand wranglers didn’t want to do one big simulation and leave the resulting imagery to the chance events that would ensue. Instead they created something that was much more controllable by the artists, with factors such as speed, direction of flow, the sort of shapes being formed, and all eminently tweakable. Key in the look development of the Sand Room’s beautifully atmospheric lighting was Lighting Supervisor Rob Allman, whilst Rothwell was also responsible for helping illuminate the sand, modifying ‘Occvox’, a piece of software he’d previously designed to handle the occluded light on Aslan’s mane in Prince Caspian. This proved very useful for handling millions of sand particles in flight. Another result of the openness of Prince of Perisa’s production team to external creative input was the look of the Hassansin Vipers, as well as the manner of some of the grisly deaths they suffer at Dastan’s hands. Used as a form of living ninja weaponry by Dastan’s foes, the vipers are six foot long, armour scaled and lightning fast. Dastan’s first encounter with them occurs during a night time rest at an oasis. Burrowing at speed under the ground and hurtling through the air to strike, the vipers nearly make short work of Dastan’s party. Fortunately, the magical dagger with which he is equipped has the power to roll back time. Using this power, Dastan is able to return to the start of the assault and anticipate the vipers’ every move, dispatching them one after the other. 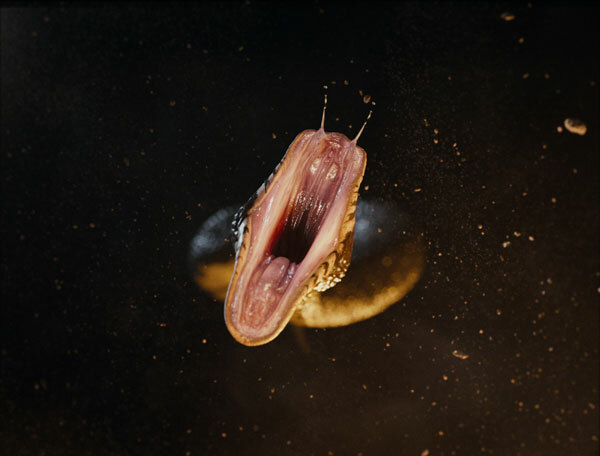 The snakes are seen in extreme close-up and in slow motion during the fight, demanding the highest level of photo-realism. A number of the London facilities involved in the film’s post production pitched for the vipers, but it was a handful of beautifully executed concept drawings created by Framestore’s Head of Texture, Daren Horley, that won the day, based on Tom Wood’s brief for a snake with armoured rather than flat scales. 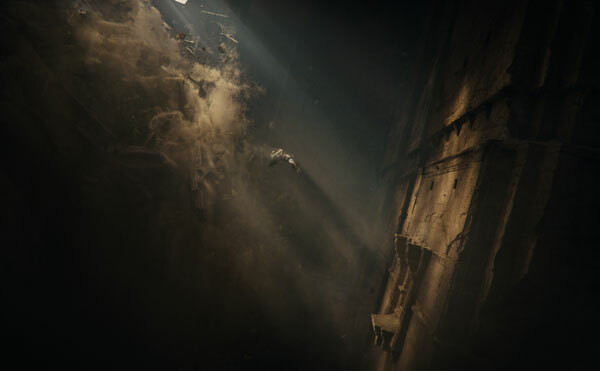 In addition, the Framestore team came up with a number of suggestions as to how Dastan might interestingly dispatch the creatures during the oasis fight. Once more, the talents of Lead FX Artist Alex Rothwell proved invaluable. With no existing in-house way of quickly attaching scales to a shape, he devised a procedural way of generating the snake, writing a snake plug-in which generated a snake with sliders covering such variables as number of scales down the length of the body, number of scales round the circumference, width of belly scales etc. 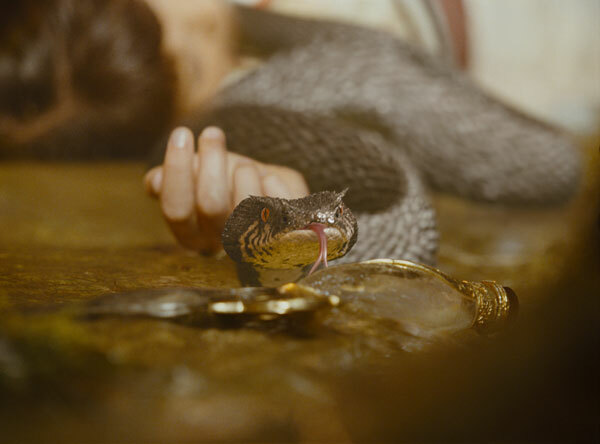 The snakes are as beautiful as they are deadly, and among those crucial to making them look and move with such deadly serpentine grace were CG Co-Supervisor Andy Kind and Lead TD Neil Weatherley.